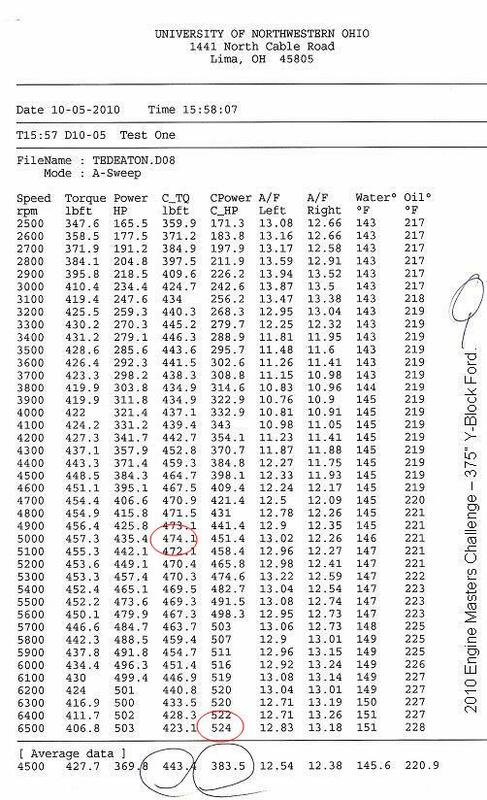 The 2010 EMC Y-Block Entry Breaks The 500HP Mark (on pump gas)!! After submitting the EMC entry form for 2010 and then the list of competitors was published, I found that I was again on the alternate list. In fact I was #10 alternate which is further down the list than where I started out from last year. But alas, things just seem to work out anyhow. Another Texas shop that had already been selected and was in the 2010 field offered me their spot. Their own entry (400 sbc) was having issues and finances being what they are this year, their entry was not going to be competitive by their own standards. With that in mind, I verified that the rules would allow for an engine change and proceded forward with a Y entry for the 2010 EMC competition under the The Car Shop of Temple banner. Eventually (two weeks before the competition), my own shop name did come up but I had already committed and didn’t see any need to change. With the Mummert aluminum heads now out and proving themselves, it was time to see how a fully ported set of these would fare over the fully ported iron heads. John Mummert performed his porting magic on a set of the castings and after some fine tuning, the aluminum heads were worth another 72+ horsepower over the ported iron heads that were run in last years EMC competition. That puts this pump gas Y engine at over 540 peak horsepower at 6200 rpms. Wow! That’s impressive. least. At this point, the engine is using 7 quarts of Valvoline 20W-50 racing oil. carburetor, etc. The ignition timing was initially set at 32° total based on the testing that was performed on the stock out of the box aluminum heads. Timing advance curves and the total ignition advance amounts were re-examined again and it was found that the ported heads preferred 38° total. 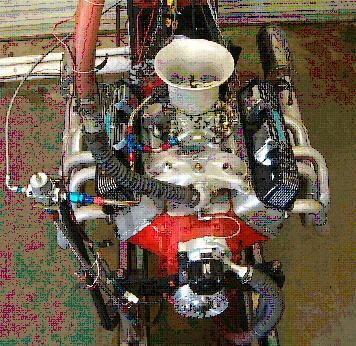 The 32° timing number that worked best on the 312 dyno mule was found to be an erroneous value as the damper on that engine had been unknowingly slipping thus throwing off the accuracy of the marks on that particular damper. This was found only after the aluminum heads had been removed and the engine was being retimed with another set of ported iron heads on it. The dyno mule now has one of the new Innovators West harmonic dampers on it which will prevent that particular problem from cropping up again. With the timing on the EMC engine now optimized,peak horsepower jumps over the 540HP mark. 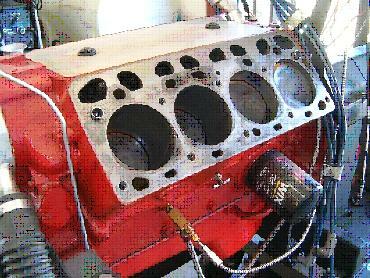 Also tried on the 375” EMC engine was a highly modified and ported intake supplied by John and Geoff Mummert. This intake had the spacer already built into it so it was tested with a variety of carbs while also experimenting with exhaust tuning changes. Ultimately, the best score for the engine was with last years Mummert dual plane intake with a 1” spacer that was highly modified on its underside by Geoff Mummert. Some topend horsepower was sacrificed for increases in lowend torque values which in turn produced higher score values. I’ll add that the score is simply calculated by adding the average horspower and torque values for the 2500-6500 test range, multiplying by 1000, and dividing by the claimed cubic inch of the engine. 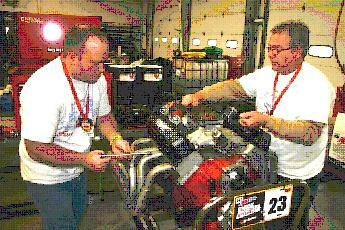 Several carburetors were tested and the carb that was scoring the best was a vacuum secondary 750cfm HP series Holley. Regardless of the rating, this particular carb was flowing over 800cfm. The vacuum secondaries simply shined in the 2500-2800 rpm range. Beyond 2800 rpms, the four other high end carbs (all double pumpers) were similar in performance to the vacuum secondary carb..
With over 150 dyno pulls on the engine, the engine was drained of oil, the WIX oil filter swapped out for a new one, and was crated up and made ready for the trip to Lima, Ohio. Team members for the Y entry for the 2010 Engine Masters Competition included Neil Elliot, Jody Gunter, myself, Jody Orsag, and Harry Hutten. As the Car Shop of Temple entry was scheduled to run at 2:30PM on Tuesday, the engine was required to be at University of Northwestern Ohio (UNOH) no later than 4PM on Monday. Our trip plans were made accordingly and we arrived there on Monday morning. Not long after our arrival, the engine was unloaded and placed in the staging area where the competitors engines are on public display until being made ready for installation on the dyno docking carts. Came Tuesday, the Y entry was mounted to a dyno docking cart. The photo sessions this year for the engines and crew came before the actual dyno session. Based on some of the carnage that can occur to the engines during the dyno competition, taking the pictures beforehand is very likely a good call from the photographers point of view. By early Tuesday afternoon, there was a number of competitors having serious detonation issues with the supplied 91 octane fuel. And several engines were having difficulty in reaching the 6500 rpm limit as a result. Many of these ended with a zero score or a DNF (Did Not Finish). as a team, We made the call to leave the timing exactly where it had tested best at home and go for it. The engine was shut off upon completion of that initial checkout. After a brief discussion with the tech inspector and the dyno operator regarding procedures and how we would like to see the engine loaded, the engine is cranked back up. By the rules, the engine runs a minimum of three minutes to warmup and the teams are given the option of having an additional two minutes of warmup if desired. We had the warm up dyno pulls commence at the four minute mark. 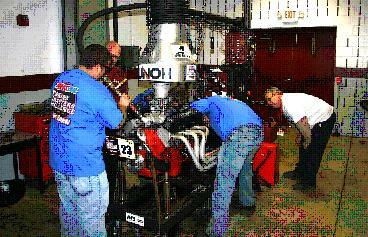 The engine was then loaded and went into three back to back dyno pulls without being shut off between pulls. These pulls were made in the 2500-6500 rpm range with the engine only over-revving each pull by 200 rpms. This was an improvement over last year where the rpms were running over the limit by as much as 400-500 rpms over the 3000-7000 rpm test range. After the three warmup pulls are completed, the teams are given three minutes to examine the data. After this, the teams are then given fifteen minutes to make tuning changes. If you can pull a head off and put it back on in 15 minutes, you’re allowed to do this. This year, there was no latitude on the tuning time. If the engine was not ready to fire back up at the end of fifteen minutes, it was DQ’ed (disqualified). I’ll add at this point that the Y entry did not experience any detonation issues during the warmup pulls and I’ll attribute part if not all of this to not running on the ragged edge on the static compression ratio as many of the teams did. The rules would allow up to 11.5:1 cr but the Y entry had its static compression ratio at 10.8:1. Upon talking to many of the competitors, it appeared that many of them were using camshafts that were on the short side for intake duration at 0.050” which in turn was driving their dynamic compression ratios to the high side and especially in those cases where the static compression ratio was targetted for close to 11½:1. The Y entry was using an Isky cam with 254°@ 0.050” intake duration and the dynamic compression ratio figured to be right at 8.5:1. Although the fuel being used in the competiton was 91 octane, the motor octane level was 86. Building the Y engine to the conservative side allowed for optimal timing while not having any detonation issues. Gotta love it when a plan actually works. But back to our story. After the three warm up pulls, the data was scrutinized and concensus was that the engine was about 1 number jet size too rich all the way around. At this point, the clock is running for the fifteen minutes of tuning. As a team, we decide to leave the jetting alone as the fear of detonation is still on everyones mind. And last years mad thrash to fix a fuel leak after a jet change still hung heavily on everone’s mind. Instead we decide to restart the engine at 10 minutes into the tuning session and make a short 3000-5500 rpm pull to simply heat the oil. At the conclusion of that pull and without shutting off the engine, it’s observed that the oil is still not quite hot enough so we instruct the dyno operator to make another similar dyno pull. When the engine is shut down, there is one minute of tuning time remaining. But what we wanted to do is accomplished and that is heat up the engine oil while at the same time start the dynometer engine cooling system so it’s refreshing itself with cool water. For the qualifying pulls the engine is started up and immediately goes into three back to back 2500-6500 rpm pulls without any steady state running. The strategy of warming the engine up thoroughly just prior to going into the qualifying pulls ended up being a good call as a significant improvement in performance over the warmup pulls is observed. The peak horsepower numbers for the Y in the run order was 523, 521, and 524HP. The final score as a result of the three qualifying pulls being averaged together was 2205.7 points. That put the Y entry in fifth place and straight to the quarantine room. This is likely one of the few venues where quarantine or impound is a good thing as the top seven points earners at any given time are quarantined. The top six run again on Friday for the money with the seventh being available in case of a rules infraction or other variable. At the end of Tuesday, the Y still sits in fifth place in overall points rankings. It took until midday Wednesday before the Y entry was bested in score enough that it could be pulled out of the impound area. Once pulled out, it was set back in the staging area where the simplicity of the engine and its vacuum secondary carb had competitors simply wondering how that engine managed a 2200+ score. By Thursday evening, all the qualifying pulls had been made and the Y was sitting in 16th position out of 40. At the banquet on Thursday night, Harry Hutten did the math and saw that the 524HP number posted by the Y was #13 in overall horsepower. Another bragging point for the Y. One of the many highlights of this trip was meeting up with and talking to both Ed Iskenderian and Nick Arias. Ed was indeed a thrill to listen to and was more than willing to talk about the early Y-Block days when he built cams for the Ford engineering group. His memory was indeed sharp as a tack and the number of stories he could relate back to was just incredible. Ed and Nick were also the key speakers at a meeting with the students at the University on Wednesday evening and both gave many valuable insights and advice to the students regarding what each had learned during their own careers in the performance industry. It was a packed room for this and the complete silence of the room while each talked was a testament to what each was saying to the audience. Friday was spent watching the final six rerun their engines and then the awards presentations took place later in the afternoon. After staying for the engine teardowns of the winning engines, we said our good byes and loaded up for the trip back to Texas. It was an uneventful trip but definitely a hard one as we drove straight through going back home. Everyone arrived safe and sound though so it has been a very good trip. A big thank you goes out to the faculty and students at UNOH for being gracious hosts and having a great site for this competition. And another thank you to the staff of Popular Hot Rodding for an event that went very smoothly which only happens as a result of very thorough planning and preparation. And thanks again to the Y crew members for the help they provided at the competition as well as thanks to John and Geoff Mummert for their invaluable help and expertise on the work performed on the aluminum heads and intake as well as suggestions and advice for getting the score to where it was. And last but not least, special thanks goes to Lonnie Putnam for the impecable machine work he does on the blocks. The goals for this year was to break the 500HP mark and be at least mid point in the scoring. Both goals were exceeded in fine fashion.